Michigan legislators increased personal income taxes 11.5 percent in 2007 with a promise that the rate would be rolled back to 2006 levels. It is time for them to keep that promise. With the new calendar year upon us it is time to remind lawmakers about sound public policies. One overlooked area the new Legislature needs to take up is large, across-the-board tax cuts. 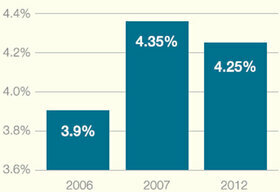 Center analysts have recommended a personal income tax rate cut from 4.25 percent to at least 3.75 percent. There are four major reasons why a tax cut is necessary. First, the money legally confiscated from Michigan residents belongs to them, not Lansing politicians or their hangers’ on. Second, the Legislature has owed us a tax cut since its members hiked personal income taxes by 11.5 percent in 2007. Third, other taxes and fees at federal and state levels have been biting taxpayers more in recent years. It’s time to reverse the damage. Lastly, taxes matter. Reducing them can encourage growth, which is no small matter for Michigan. We need a tax cut because tax policy matters to growth and the Great Lake State needs a lot more of it. There are plenty of areas to cut in the state’s $52 billion-plus budget to offset revenue losses. I recently published a list of 35 ideas for $2.1 billion in spending reforms. Surely thoughtful legislators concerned with preservation of taxpayer resources could adopt or adapt at least one or two of them. Even if lawmakers believe our money is their money, we are owed a large personal income tax cut. Recall that the state income tax rate was hiked from 3.9 percent to 4.35 percent in 2007. We were promised this was only temporary and would be rolled back starting in 2011. Ultimately that rollback was delayed and then scrapped altogether after a puny 0.1 percent cut to 4.25 percent. It is time for Lansing to keep its tax cut promise. Don’t forget that fees have been piled high on Michigan residents, too. The Fiscal 2014 budget alone contained $82.6 million in new and higher fees on businesses and families. And these are just at the state level. Other tax and cost increases have been imposed from Washington. Congress permitted President Bush’s tax cuts to expire and taxes and fees also went up under Obamacare, and that was in addition to the spiraling cost of existing health care plans. I can’t be the only person tired of being nickeled-and-dimed and “dollared” to death by all levels of government. Michigan was only one of two states in the union to experience negative economic growth from 2000 through 2009 as measured by real state Gross Domestic Product. We need a tax cut because tax policy matters to growth and the Great Lake State needs a lot more of it. In February of this year the John Locke Foundation published its review of 528 academic papers and professional journals published between 1992 and 2013. Of the more than 100 that zeroed in on local or state tax burdens, 64 percent showed a negative link between burden and economic growth. In 67 percent of studies reviewed on narrower topics a negative link was found between higher personal income taxes and economic growth. The entire JLF review should be required reading for Michigan lawmakers, but it need not be the only one. The papers “What is the Evidence on Taxes and Growth,” published by the Washington D.C.-based Tax Foundation and “Tax Myths Debunked” by the American Legislative Exchange Council are both worth legislators’ time. The bottom line is that the state’s bottom line carries more revenue than is needed. Paring back both state spending and state personal income taxes are ideas whose time has long since come.